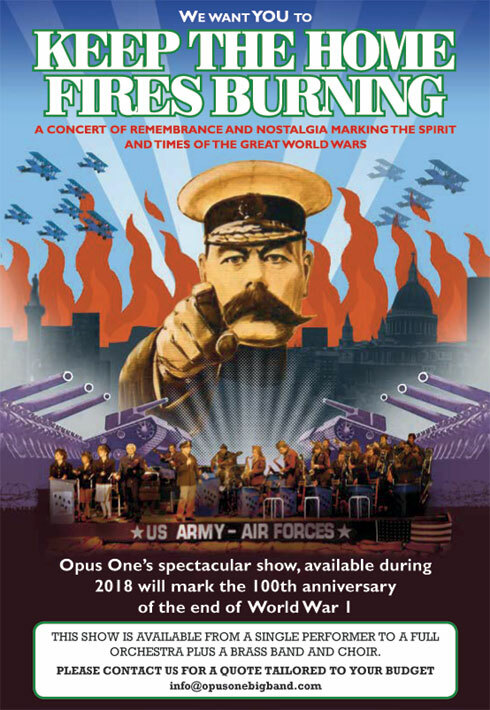 A commemoration concert marking the 100th anniversary of the outbreak of World War 1, featuring Opus One Big Band, Ware Brass Band, Ware Choral Society and featured soloists. 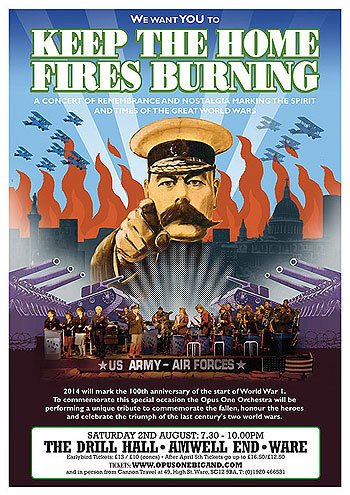 Comprising mix of rousing military brass band music, upbeat Glenn Miller era big band swing, unmistakeable close harmony singing and featured set-pieces with authentic costumes, this event will evoke the spirit of the times and serve as a timely reminder of the sacrifices made and the triumph of human spirit over adversity. 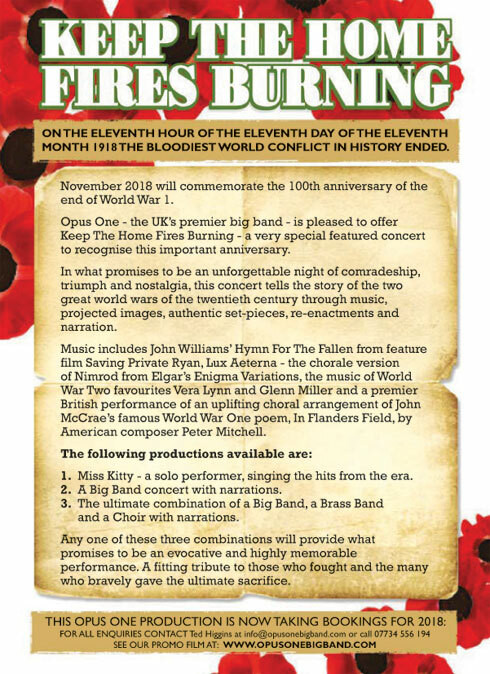 Keep the Home Fires burning will commemorate the tragedy, heartache, comradeship and triumph with an unforgettable performance guaranteed to be remembered long after the final echoes of The Last Post have faded. Jacqueline Barron, recognised for her versatility in singing repertoire ranging from operetta and musicals through to contemporary music and jazz, has appeared in London's West End, notably as Christine in The Phantom of the Opera, and in a number of touring shows such as The Magic of the West End Musical, Showstoppers and West End Nights! Broadway Lights! She has made many radio broadcasts and is much in demand in the recording studio, singing incidental music for television and countless Hollywood movies such as The Lord of the Rings, Troy, Charlie and the Chocolate Factory, Harry Potter and Shrek Forever After. She has been a soloist with orchestras such as the RPO, London Sinfonietta, RTE Dublin, English Sinfonia and the BBC Concert Orchestra. Jacqueline is much in demand in the recording studio, singing incidental music for television and soundtracks for many major Hollywood films such as Star Wars, Captain America, Pirates of the Caribbean - On Stranger Tides, Kung Fu Panda, Shrek Forever After, Megamind, Harry Potter and The Lord of the Rings. She spent two weeks in Los Angeles recording the music for Troy. She sings on the musical Nine and has recorded songs for James Horner, Eric Levi, Ennio Morricone and Debbie Wiseman and Alan Hawkshaw. TV credits include Criminal (BBC drama), Poirot, Midsomer Murders, Taggart, Love Soup, Pepys and Innocents. Hers is the voice of the cabaret singer in the film Fade to Black and in Lucitania: Murder on the Atlantic (BBC). Jacqueline is a soloist on The Music of Andrew Lloyd Webber album (All I ask of You and Pie Jesu from the Requiem). 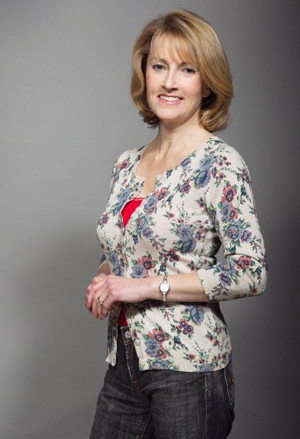 She frequently works with the BBC Concert Orchestra including roles in Sondheim's A Little Night Music, Novello's The Dancing Years and on Friday Night is Music Night (BBC Radio 2). “Keep the Home Fires Burning” one of the major commemorations of the 100th Anniversary of World War 1 played to a sell out crowd on 2nd August in the town of Ware, Hertfordshire. The event was held in the Ware Drill Hall actually a Word War 1 army recruiting station The concert featured the Opus One Swing Band, Ware Brass and Ware Operatic Society as part of a cast of over 80 musicians and actors. It featured the première of two chorale pieces composed by an American Peter Mitchell from Chicago. The two pieces “In Flanders Field” based on the poem by Canadian surgeon Major John Mc Crea and “On the Beaches of Normandy” had only ever been performed before by the resident choir in Fox Valley near Chicago USA. Despite suffering a stroke 8 weeks before the concert, the composer Peter Mitchell together with eight of his family still managed to make the trip from the USA, although he was not well enough to conduct his work. Just wanted to thank you for being the inspiration of Saturday's Concert. It was an enormous undertaking and I can well believe it took years to plan and come to fruition. There were so many threads that had to be pulled together but I think the Night was an outstanding success and you have to be congratulated. One member of the audience said that it should have been on for two nights!! I had given my family a three line whip as we are always supporting them in their ventures and they always seem to have "other engagements"when we are doing our Concerts. Anyway they did turn out in force and our five year old granddaughter was dancing in the aisle to the Glen Miller music and they all enjoyed the Concert very much. What courage it must have taken for Peter Mitchell and his family to undertake the long flight from USA so soon after his Stroke. because I was involved with the Hertford & Ware Stroke Club for many years,I spoke to them at some length at the Thursday rehearsal and he seemed very pleased with the way we had performed his music on Saturday. Watching the moving ceremonies on TV, the Flanders Field poem was part of the Service. Once again many congratulations on the success of "Keep the Home Fires Burning". We were in the audience last night and would like to congratulate you and all those that took part in a wonderful show. It was an excellent Commemoration to all those that served in the armed forces. Only the town of Ware could put on such an evening. I do hope you will give a copy of the DVD to the Ware Museum and Library for their records. AFTER OUR SELL OUT CONCERT IN NOVEMBER 2014 AT WARE DRILL HALL, WE ARE PLEASED TO ACCEPT BOOKINGS TO REPEAT THE SHOW IN 2018.